Classic FM was a staple in my family’s weekend songs of choice. While I shuffled around the house in Adidas clobber, wrapped in the thin, teenage threads of Britpop, my dad would be sitting in the kitchen, cigarette poised over ashtray, losing himself in the strings of Vivaldi, Mozart, Bach, and Schubert. An echo of tutting at one another began many a Sunday morning, but perhaps it was here that I learnt to appreciate tonight’s performer. 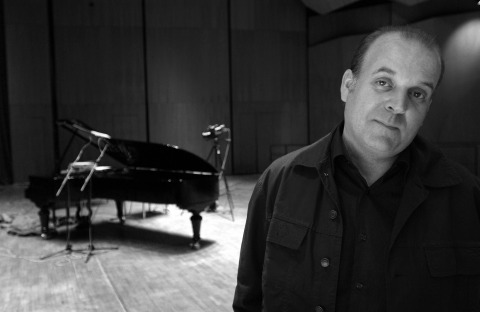 Craig Armstrong is a Glaswegian-born, London-educated composer and musician who was first celebrated worldwide for incredible movie scores in the late 1990’s. At a time when strings were strongly in favour (The Verve, Oasis, McAlmont and Butler, etc), Armstrong’s evocative music chimed and vibrated in the bones, both tender and impassioned. Grammy’s, Golden Globes, and BAFTA awards were awarded for cinematic triumphs such as Moulin Rouge and Ray, and collaborations with big-hitters such as Madonna and U2 heralded that a modern-day, classical composer had finally found a formula that could work on a contemporary pop scene. Armstrong’s mix of classical and contemporary sounds were afforded a full orchestra at the Royal Concert Hall this evening in front of an eager crowd, keen for a glimpse of the rarely-sought son of the city. Starting with fond favourites from his ‘The Space Between Us’ record (1997), Armstrong and his orchestra rumbled through horns and brass during “O Verona”, then electronically during “Weather Storm”. The introduction of the exquisite Jerry Burns wrapped up the earlier hits with a seductive performance during “This Love”, not unlike the alluring delivery given by Portishead’s Beth Gibbons while swaying at the microphone, but with a marginally cleaner, purer delivery. At this point, Armstrong opted to leave his piano, not for the only time, and allow Clio Gould to take centre stage with some breathtaking violin work during songs from ‘The Great Gatsby’ score. Despite the irritation of some latecomers teetering into their seats, the Orchestra of Scottish Opera flowed wonderfully with crashing cymbals, swaying brass, and rewarding throes of tuba, yet were never at their most haunting than when Gould’s violin pierced through the cavern of noise. The strings emerged victors in whatever this war was. The accompaniment of footage from the film assisted in narrating the story, providing pictures to Armstrong’s tender thoughts and dissolute melodies. Returning to the piano, our host welcomed Jerry Burns once more to the stage for the heart-breaking “Dust”. This was the first song off the new album ‘It’s Nearly Tomorrow’, and could easily have accompanied footage of any of Glasgow’s tragedies in recent times – the propellers of the helicopter wedged into the roof of the Clutha Vaults; the ugly scenes at George Square following last year’s referendum; or the horror etched on Christmas shopper’s faces after witnessing the bin lorry crash. Burns’ vocals have featured previously on Armstrong’s work, and it is obvious why as her fragile delivery compliments the equally-frail, but arresting, music that carries each word that falls from her lips. Add to this mix a bewitching harp and minimal orchestra interference, and a real classic begins to spellbind the audience. A further fantastic contribution from Lucia Fontaine and Katie O’Halloran on Suede’s Brett Anderson-penned “Crash” preceded some prepossessing cello work by Alison Lawrance during the powerful “Piano and Cello Theme” from the ‘World Trade Center’ film. Trumpets herald the light after the collapse of the twin towers in the picture, while minimal piano notes dart into the small gaps that remain in people’s hearts affected by the attack. Armstrong used his entire orchestra, with Bond-esque trumpets, magical percussions, and clarinets snaking between lines during two numbers from the Moulin Rouge score. Strong vocals provided by Katie O’Halloran and the suave James Grant melted like butter into the instruments bearing their incredible voices. After the interval, the romance of the harp, the lovelorn violins, gasps of trombone, and destructive cymbals reverberated on each note during “Glasgow Love Theme” from the film, ‘Love Actually’. However, it was Armstrong’s affection towards Peter Mullan and his theme for the 1998 film ‘Orphans’ which really hit the tender spots whereby cinematography behind the orchestra somewhat distracting the viewer from the incredible soundtrack which accompanied the picture. It is only when Alistair Ogilvy delivered guest-vocals on the slow and thoughtful “Wake Up In New York” that the audience were able to return attention to a central focal point, and wonderful lyrics concerning the ‘….drug store on First Avenue’ transported each one to that remarkable, sleepless city. An unreleased film from Scandinavia provided the source of inspiration for the next song. On this occasion, Linda Cochrane played piano, and the mix of pink lights dancing on the ceiling, gentle harp and quivering violins all contributed to a fascinating composition. The premature applause of the crowd after what appeared to be the final flute note did not appear to distract either composer or orchestra alike. As the concert reached the three-quarters point, Armstrong chose to introduce another four songs from the new album; “Sing” was a pulsating, abrasive number where you would never have known there were strings until the conclusion if it hadn’t been for visibly being able to see bows moving; “Powder” was perhaps one of the weakest inclusions in the set with lyrics that could be deemed slightly corny (“…sunlight / songbirds”) until the duet of Burns and Grant on the final verse rescues the number; “Strange Kind of Love” was far more stripped with subtle violins and a gorgeous Durutti Column sound on guitar; and “Lontano” was a wonderful return to the electronic beats and angelic strings favoured by Bristol trip-hop acts in the mid-nineties. Two further songs returned Clio Gould to the fore with her poetic violin, and allowed guitarist Ryan Joseph Burns to step up and serenade the crowd over simple keys and a maraca beat. Before wishing his audience goodnight, Armstrong returned for an encore to play ‘three small piano pieces’, dedicated to his family living in Glasgow. At this point, the orchestra downed tools and allowed the beautiful “Leaving Paris” and the affectionate “Angelina” (for his daughter) to be played. As if there could be any other contender, Armstrong saved the best for last – the wonderful “Balcony Scene” from the ‘Romeo and Juliet’ film. This was the song which turned me, and many, many others on to his brand of contemporary, classical compositions and this overwhelming beauty moved a number of the audience to tears. As far as romantic songs go, this one is a contender for the greatest in history – and most likely the least recognised. If Armstrong is to be believed, his new album is “a Glaswegian record”, with many of its vocalists emanating from the city. There is often a proclivity among Glaswegians to disregard its cultivated and elegant side, and shy away from the more honed, sophisticated ways of the world. In Craig Armstrong tonight, the city finally learned to pat itself on the back; one of our own done good. I am very jealous, it sounds like a fantastic concert! It is just a shame that Craig performs so rarely, and when he does it is usually in his home city. Would it be too much to ask for a small tour so that his fans from outside Glasgow could get to experience the live magic of the songs with full orchestra? He would be an ideal candidate for the Proms season!